Do you have a hard time controlling your intake of food? Does this particularly apply to foods that are high in fat and sugar? Food addiction may be to blame for this. Scientists, psychologists and other experts have recently begun to recognize this condition in adults around the world. As with other addictions, an addiction to food implies the loss of control over the intake of food, a dependence on certain kinds of foods, and an inability to stop despite experiencing negative consequences. The concept is new and it is still not well understood. What we do know for sure is that treating food addiction cannot be done in the same way as an addiction to drugs or alcohol; you can’t tell a person to work on stopping eating or abstaining from food. Instead, treatment is complex and sometimes looks intently at the psychological reasons a person may have developed this addiction. Treating an addiction to food is very important, as overeating can lead to many health problems. An addiction to food is thought to be caused by hyper-palatable foods. Obesity and other weight issues are becoming a bigger and bigger problem around the world. One factor that may play a part is food addiction which would make it extremely difficult for people to resist urges to eat foods that are not healthy. While this concept is in its nascent and developing stages, many experts are beginning to believe that it is possible to develop an addiction to food. For something to be called an addiction it implies that the person being described as addicted has lost control over their use of something. It more quickly calls to mind drugs and alcohol, but addictions can be behavioral as well. One example of a commonly recognized behavioral addiction is an addiction to gambling. More recently food has been given attention as a potentially addictive substance, particularly very palatable, typically unhealthy, foods. 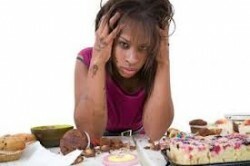 Food addiction occurs when a person compulsively overeats, cannot control their eating, and does not or cannot change their eating behavior despite experiencing negative consequences because of it. They feel cravings for food and may experience withdrawal symptoms, such as anxiety, when they have not had certain foods for some time. The concept of food addiction is still developing and an exact diagnosis of the condition is still in the works. One important component of any food addiction diagnosis, however, is the fact that food has caused distress in a person’s life yet they are unable to stop eating certain foods. Foods with certain qualities are thought to be more addictive than others. According to WebMD these are highly palatable foods which are high in sugar, salt, and/or fat. When you eat certain foods do you end up eating much more than planned? Do you eat certain foods even though you are no longer hungry? Do you eat to the point where you feel physically ill? Do you often feel fatigued or sluggish because of overeating? When certain foods are not available do you go through great lengths to get them despite having access to other foods? Have you felt withdrawal symptoms such as agitation, anxiety, or other physical symptoms when you cut down on or stopped eating certain foods? Do you have elevated cravings for certain foods when you try to cut down on or stop eating them? Does your behavior with regard to food or eating cause you significant distress? Do you experience significant problems in your ability to function effectively because of food and eating? Has your eating been causing you significant problems such as depression, self-loathing, or grief? Has it caused or worsened physical problems? Do you keep consuming certain types of food despite mental or physical health problems that are caused by it? Do you want to or have tried to cut down on eating certain foods before? The questionnaire is associated with a scoring technique which helps determine the severity of a person’s food addiction. Essentially, the more positively you answer these questions the more likely you are to score high on the scale and be considered addicted to food. To say there is one cause of food addiction is likely too simple. As with most addictions, a combination of genetic, environmental, biological, and other factors encourage the development of the condition. There are, however, surely interactions in the brain that can lead to an addiction to food. According to a study found in the JAMA Psychiatry Journal, “Similar patterns of neural activation are implicated in addictive-like eating behavior and substance dependence: elevated activation in reward circuitry in response to food cues and reduced activation of inhibitory regions in response to food intake.” This activation of the reward system can prevent people from adequately controlling their food intake, which is a component of food addiction and can lead to many of the other components. The reward activation associated with food addiction, according to the American Psychology Association, is not caused by all foods. Where it may be more desirable to become dependent on or addicted to nutritious foods, this is not what happens. Instead, it’s ‘hyperpalatable’ foods that trigger cravings and brain responses leading to addiction. These hyperpalatable foods are junk foods, the foods that are high in fat, salt, and sugar. Similarly, a study discussed in a Harvard University publication found that the glycemic load in foods is a major factor in how addictive they are. Weight gain is caused when a person takes in more calories than they burn. In the case of food addiction, many of the foods a person overeats are high-calorie, high-fat foods which makes the risk of weight gin very high. This leads to many of the problems described above. What Kind of Food Addiction Treatments Exist? The need for effective food addiction treatment is very clear. An addiction to food causes significant problems in a person’s life, and can even contribute to the development of potentially fatal conditions. Food addiction treatment is different than the treatments for most other addictions, such as those to drugs or alcohol. In these cases, abstinence is recommended. However, food is necessary to the life of every individual and abstinence from food is simply impossible. Instead, people may be helped to abstain from certain foods or encouraged to manage their eating. Psychologists, nutritionists, and doctors are usually those who would help in a case of food addiction. “Therapeutic Fasting”: According to WebMD, this method is used by clinical psychologist Douglas Lisle and his colleagues. Patients in this program go through a period of water-only fasting in an effort to ‘re-boot the hard drive’ in their brains. Following the medically-supervised fast, these patients are helped to develop a diet that emphasizes fruits, vegetables, whole grains, nuts, beans and seeds. Break from the foods that cause you problems: Taking a close look at the foods you eat – such as through a daily record – can help you identify the foods that particularly cause trouble for you. As food addiction is most associated with hyperpalatable foods, your problem foods are likely to be in this category. These foods are considered your ‘triggers’. Many treatment programs advocate complete abstinence from these foods that you crave. While this will be difficult at first, after about three weeks you stop craving those foods as much. Improve your relationship with food/Mindful Eating: According to Jennifer Sygo, the director of nutrition at the Cleveland Clinic, through the process of developing mindfulness about eating one can potentially alter and prevent food cravings. Mindfulness is being aware of one’s behaviors and habits without judging them. The practice in regards to food requires people to eat in a very deliberate and aware manner, taking the time to consider the shape, size, color and smell of the food very intently before eating it, and doing the same while eating. This can help people understand their binge eating and other addictive behaviors, and eventually overcome them. Support groups: Support groups such as Food Addicts Anonymous use a 12-step model of food addiction treatment and recovery. This program believes food addiction occurs at the cellular level and cannot be cured by willpower or therapy alone. They believe it can be managed by eliminating addictive foods, following a nutrition program, and following the Twelve Steps of the program. Similar programs also exist. All in all, food addiction recovery is possible. It will require working closely with a psychologist and nutritionist, and may also require you to try several different methods. As science and psychology get closer to understanding food addiction itself treatments will likely become more standardized. Methods of Help for Food Addiction Recovery - Overcoming food addiction is possible. It will take work and determination, but with the right education, treatment, support and perseverence you can overcome.